OLK Converter tool is most widely used Software which converts olk15 File or olk14message File of Mac into Outlook PST format in Windows Platform. OLK converter maintains the hierarchy of folder structure, keeping data impaired to avoid any confusion. Data related emails such as "to, from, subject, message body, header" is also maintained. The OLK to PST Converter is designed for complete Conversion of OLK files in PST Format. It configures all emails of OLK message & olk15messages files & export into PST file format without losing any single bit of information. 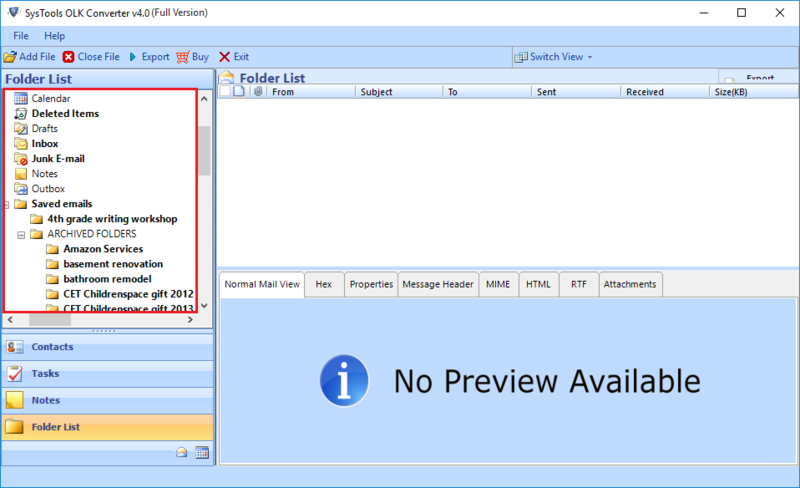 User can preview the data items such as emails & calendars details before exporting OLK file data into Outlook PST format. This will helps user to view the data items stored in OLK file and user can select desired items perfectly. 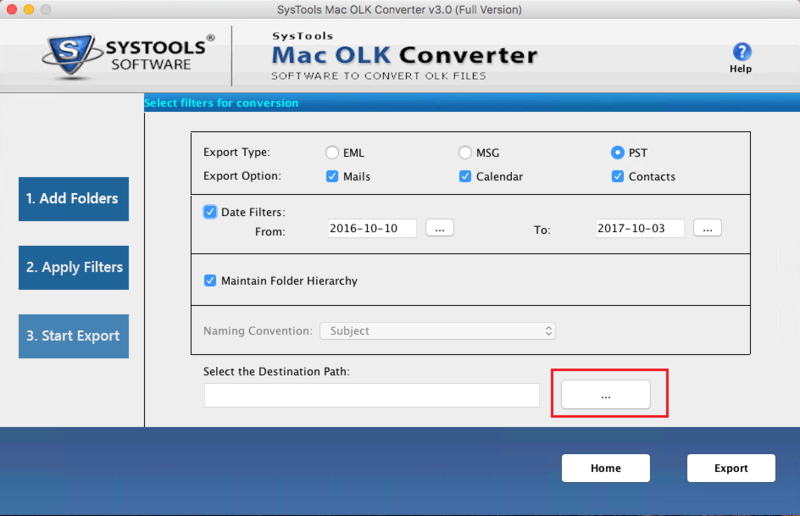 OLK14message converter not only export OLK file to PST format but it also provides an option to split large exported Mac Outlook File into small PST File. User can select the range after which the OLK file split and saved into destination path. Convert olk14message to PST format created by Mac Outloook. OLK to PST Converter supports conversion of olk15message OLK14Event, OLK14Attach files in bulk. 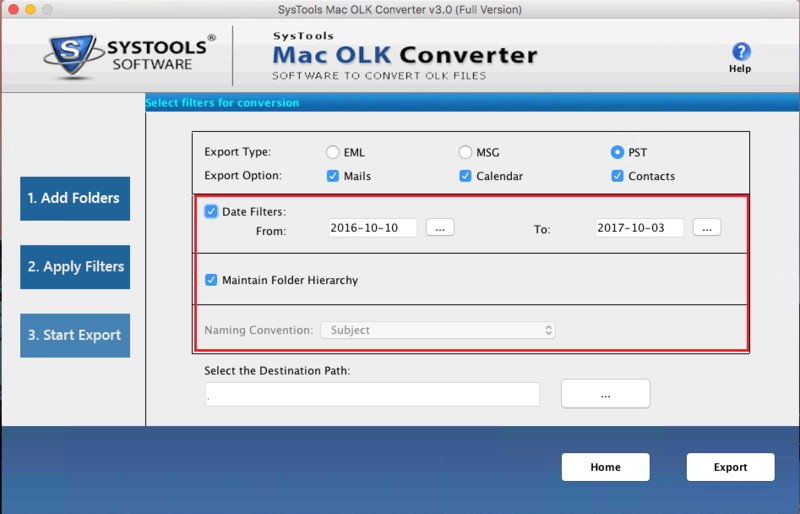 The OLK Converter offers an option to convert Emails & Calendars files stored in selected OLK File. 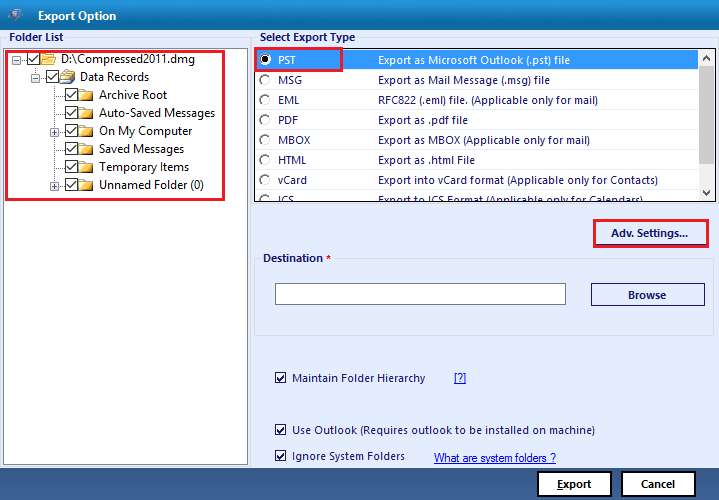 A user can export desired items by checking the selected emails and Calendar files only. Now with PST File format, you can also select another file format such as “ MSG, EML, PDF, MBOX, HTML” File format to save information stored in Email, Contacts, Calendar saved in Olk14messages and Olk15messages. OLK File Converter - A Close Insight! An OLK Converter is one of the best in the market to convert OLK files into PST format. It enriched with numerous features of advanced filtration such as viewing emails messages & calendars details before exporting files. It is enriched with numerous superior characteristics that make the OLK to PST conversion a high quality & techie changeover process. OLK files are created by Outlook 2011 built for Mac Operating Systems. OLK files on MAC are read by external applications and users cannot open them in Mac. However, OLK file converter can convert olk14message to PST type file. This way the files become available and readable for Windows Operating system. It is difficult to convert OLK14message, OLK15Message file into PST format. 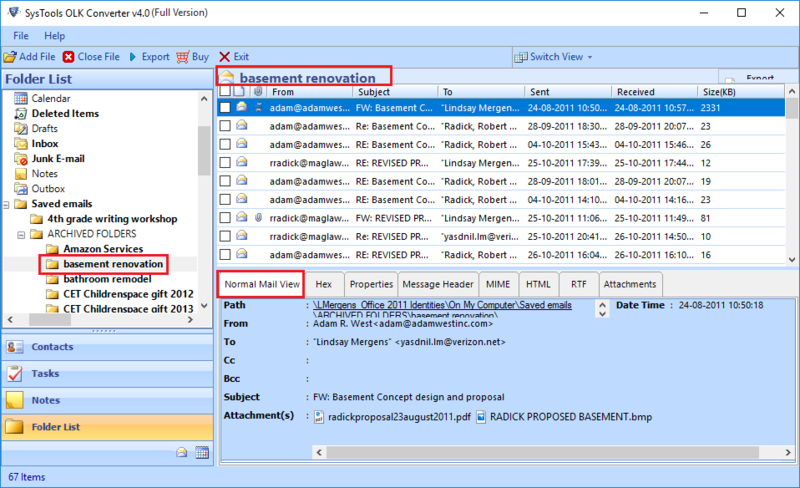 As Outlook Supports PST File format to store data such as Email messages and Calendars details etc. To Convert Mac OLK File to PST format without using any manual method, user can go for automated solution such as OLK to PST Converter. Check the Radio Box of File or Folder to select OLK File. In Advance Scan option attachments not scanned via Software. After browsing DMG File. Click on ADD Button option to proceed further. Now Software will Display all the Folder in Hierarchy Order. 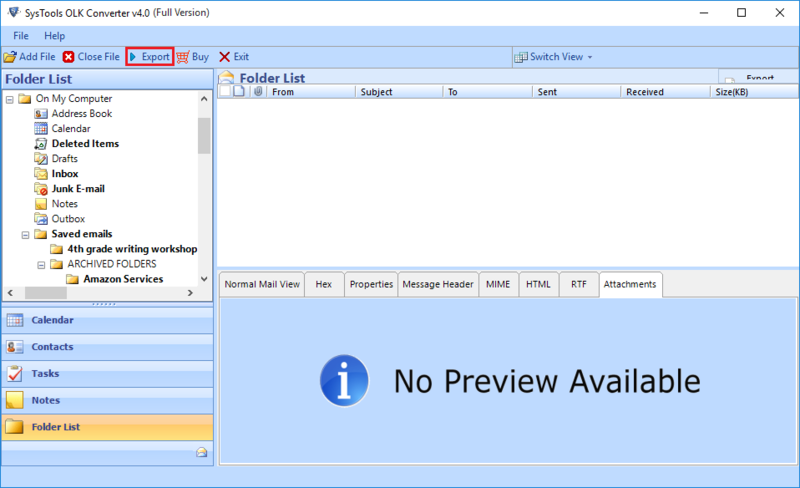 Now Preview Details of Emails along with attachments stored in OLK format. 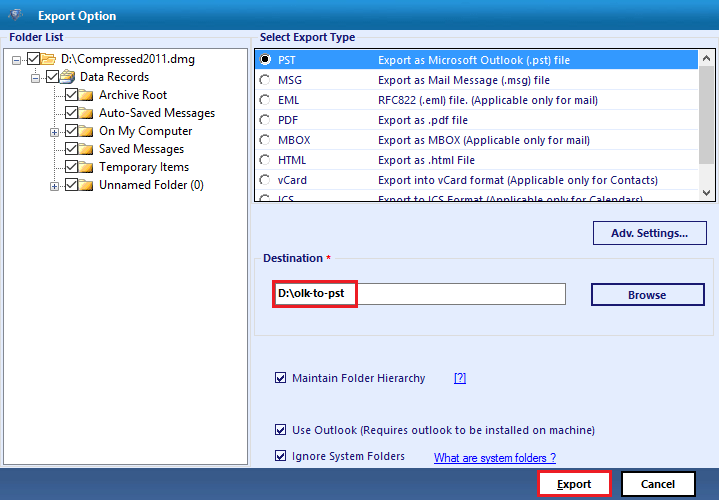 After selecting desired emails files, Click Right or select Export option from OLK to PST Converter Interface. A prompt will appear with message “Export Process Completed". Click on OK button. OLK Converter Tool - User Queries! Can OLK 14message Converter supportes bulk conversion of olk14messge/olk15message files of MAC into PST format? Yes, you can convert single as well as multiple olk14message files at once into PST format with the help of OLK to PST Software. Can I see Attachment of an email before exporting file? Yes, In OLK File Converter user can view emails in Normal View option . In this mode, user can view email body, address details etc. In attachment view, a user can view attachments related to the email. Is there any file size limitation on OLK file size while converting OLK file into PST format? 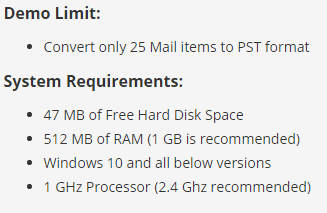 No, OLK 14message Converter does not enforce a size limitation on OLK file. You can convert any size of OLK file to PST using this software. Convert Mac OLK14messages/OLK15message to Outlook PST Format with Mac OLK Converter. It convert emails, calenders, contacts stored in Olk files without any data loss. When Olk to PST Converter export OLK messages to the destination, during the whole conversion, software maintained the hierarchy of all folder structure. This will help user to find messages file in PST format. Software maintains all folder form of files; before & after conversion. The OLK to PST Converter designed to smoothly convert olkmessage & olk15messages to Outlook PST Format. User can convert OLK file information such as Emails, Contacts & Calendar details to PST format. No Single bit of data loss occurs during the complete conversion process. OLK Converter offers an option to export OLKmessages emails of specific duration. Just select the Data of specific duration, software automatically exports the olkmessages to PST format of selected dates. 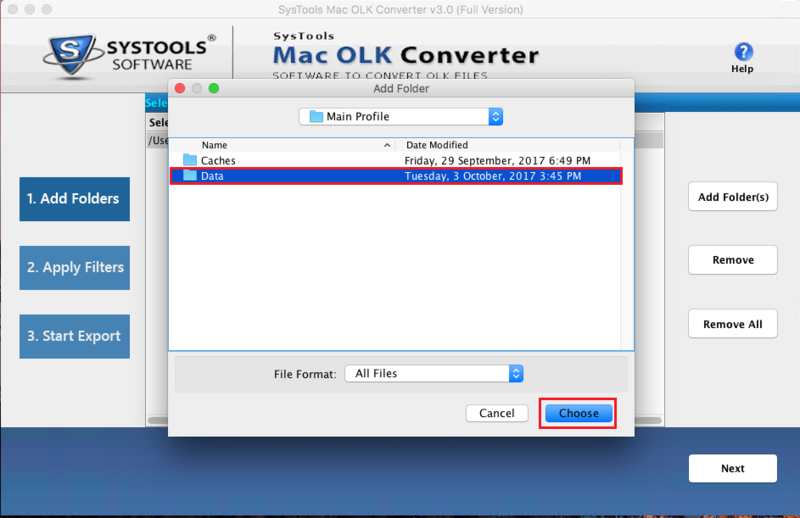 Mac OLK File Converter - A Close Insight! To know more about OLK to PST Converter, a user needs to understand some facts about Olk File format. 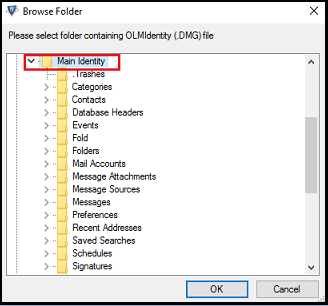 In Mac, Outlook Application store a temporary file of user profile in OLK file format. 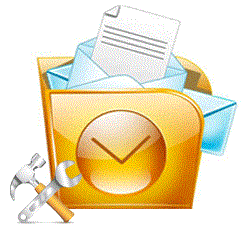 As various olk14 file format created to store different component of Mac Outlook. When a user read some email file, then olk message format act as backend file. Different file such as olk15message, olk 14 msgsource are created in Mac Outlook suite 2011. Advance Mac OLK to PST Converter helps to export these OLK format file into PST format, supported in other windows system. An Olk file created in Mac Outlook to store user emails, contacts & calendar details. Since Outlook emails data not stored in a single olk file, but divided into the different olk files and to convert these olk files into Outlook PST format can be a challenging task if user tries any manual tips. To avoid any kind of data loss issue and to view mac olk data in PST format. A Mac OLK to PST Converter is the best tool for the conversion. 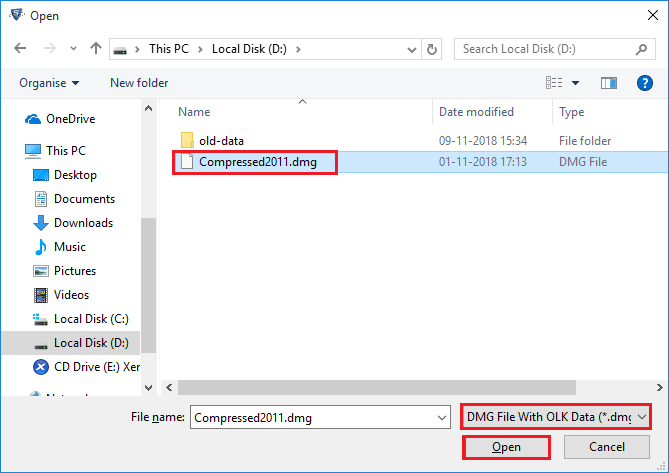 Now Select Desired File format to save OLK14MESSAGE. Browse the Destination path to save the resulted file. Navigate and Select the location for the exported olk files. Now Preview the Destination path within software. Mac OLK to PST Converter dispays Live export process of Mailbox items. 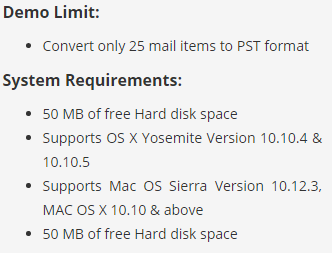 Mac OLK to PST Converter - User Queries! 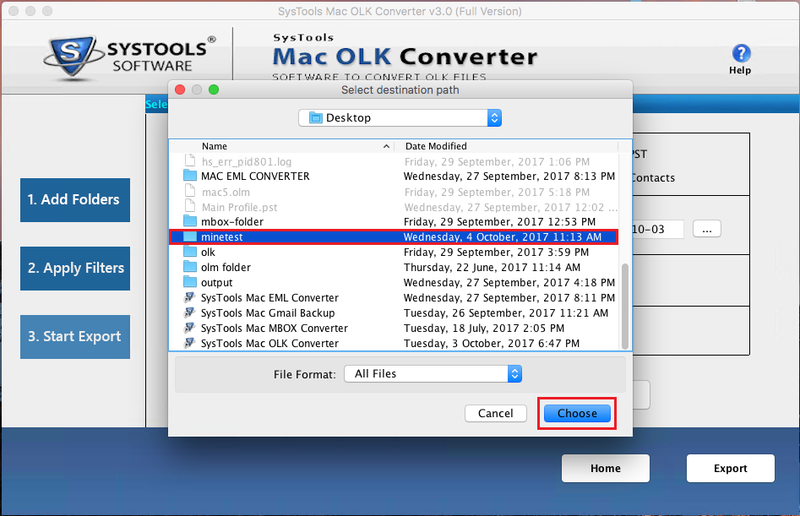 Is there any limit of conversion of data items on Mac OLK to PST Converter? Yes, In the demo version of Mac OLK converter, a user can only export 25 items per folder of OLK. Yes, In Mac OLK File Converter user can view emails in Normal View option . In this mode, user can view email body, address details etc. In attachment view, a user can view attachments related to the email. What about the edition of Mac supported by OLK Converter? 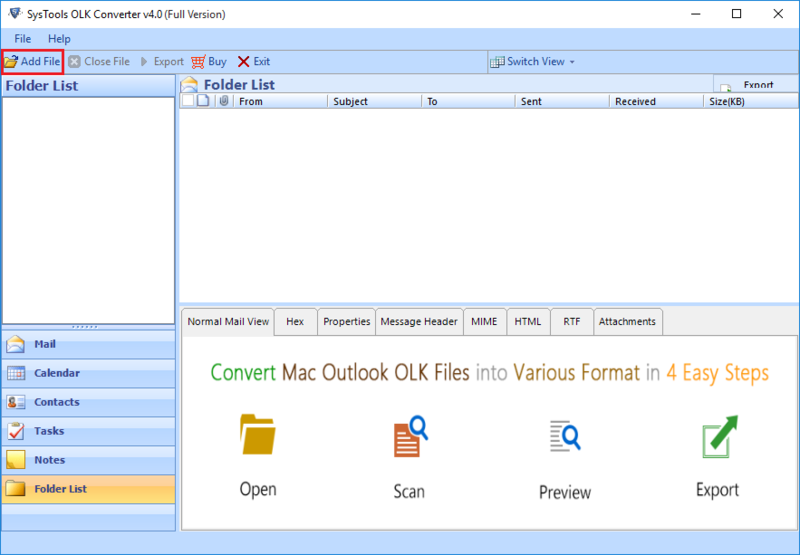 OLK14MESSAGE Converter helps me to export my OLK14MESSAGE Files of MAC into Outlook PST File. Different filtration option such as Naming conversion & Date based filter helps me a lot while converting the OLK file. OLK Converter tool helps me to find the solution to convert MAC OLK file into PST Format. Tools also embedded the all the attachment along with emails during conversion of the OLK14MESSAGE file. The effectiveness of OLK to PST Converter to quickly convert the data items like emails & calendars in PST file format is amazing. To be honest the OLK Converter helped me a lot in the conversion of OLK to PST File that other tools are failed to do. Worried about, how I can move my OLK14 messages of Mac into my Outlook profile. My friend recommended me OLK to PST Converter, Confused whether tool converts OLK15message also. But after complete conversion, Tool clear all my doubt watching the converted PST File from OLK file.